Enter Coupon Code: "aprilpromo5" at check-out to save 5% and also receive FREE Travel Bidet. IB 835 also includes FREE shipping. The all new Bio Bidet IB 835 Integrated Toilet System combines a bidet and toilet altogether in one package. Since it comes as one unit, you can install it just like any other toilet - but you'll also be able to enjoy all the features of a bidet seat too! First, let's talk about about the toilet a little bit. The toilet is constructed of vitreous china, which is the same material used to manufacture the most luxurious toilets in the world. Its seamless, one-piece design is sure to add a modern and contemporary look to your bathroom. Unlike other toilets, the water tank is concealed towards the back so the tank doesn't protrude upwards like most toilets do. In other words, the water tank is not visible which adds to its sleek look. The bidet functionality included with the IB 835 is comparable to that of the finest bidet seats we carry. 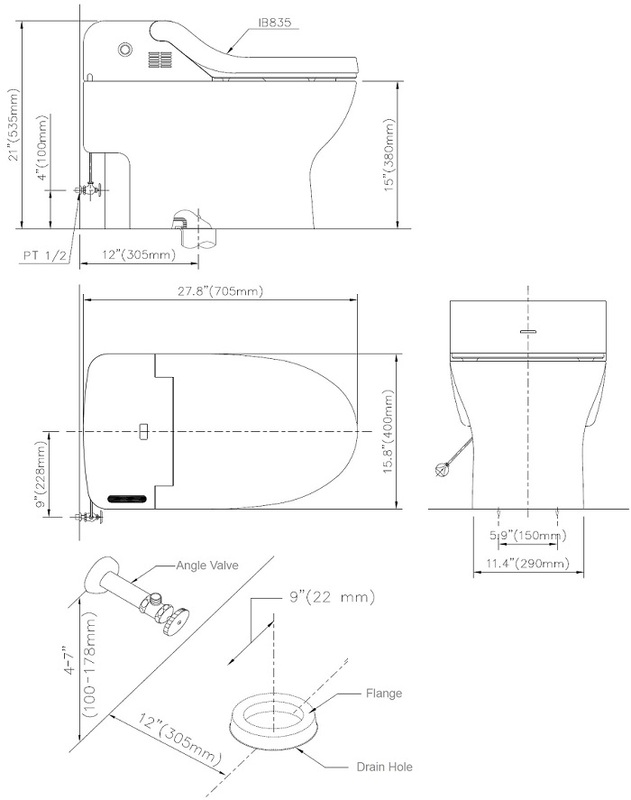 Equipped with both front and rear cleansing, this integrated bidet/toilet system features adjustable water temperature. An advanced tankless water heater is housed within the unit which heats water on demand. You can also adjust the water pressure, and adjust the position of the wash nozzle to move the spray more forward or more backward for maximum hygiene. The oscillaing cleanse moves the spray back and forth beneath you extending the wash area. The unit's water pulse can be used as well to pulsate the water stream. Non-wash features include the popular heated toilet seat which is a must-have feature during the colder winter months. The warm air dry will help with residual moisture after washing. A powerful automatic air deodorizer is included which helps with unwanted odor, and the slow-closing seat and lid means no more slamming toilet seats in your home. 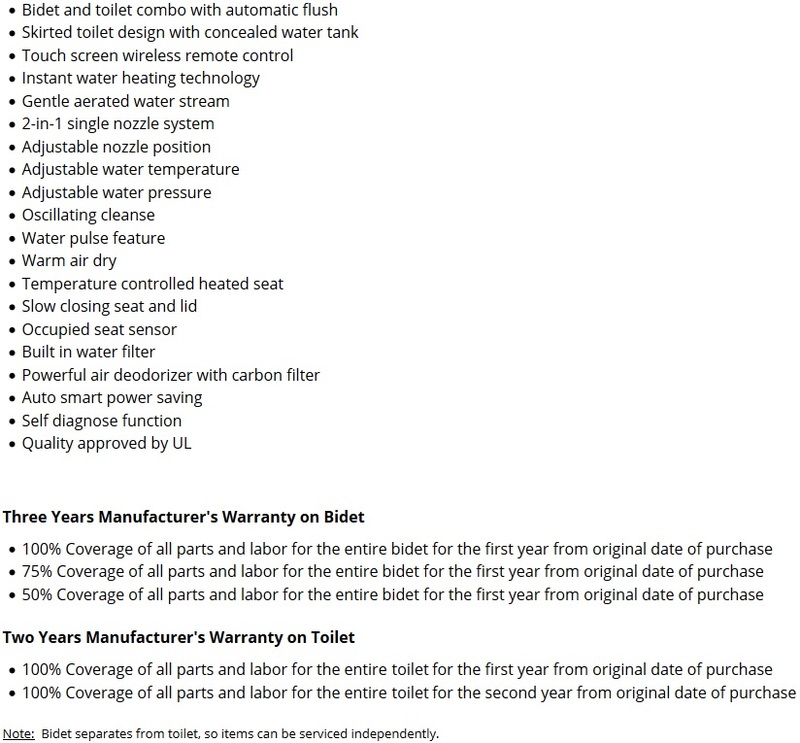 Packed with the latest features available, this is a high-tech "smart" toilet your whole famly will enjoy. Please review shipping and return policies for IB 835. Note: Bidet separates from toilet, so items can be serviced independently. We recently installed the IB 835 integrated system in our newly re-designed bathroom and I must say it is the best thing we put in there! We did consider purchasing an attachable bidet to put on a toilet, but the seamless look of the integrated unit won me over. We needed a new toilet anyway. The bidet and toilet work really well together, and there's even a flush button on the remote control so you don't even need to touch the toilet when done. The wash functions work exactly as described. Again - everything is right there on the remote control so a couple button presses does everything. Way to go on making a fantastic product!